Majority Islam (Sunni and Shi'a), minorities Christianity and others. The Federation was formed on 14 February 1958, when King Faisal II of Iraq and his cousin, King Hussein of Jordan, sought to unite their two Hashemite kingdoms, as a response to the formation of the United Arab Republic between Egypt and Syria. The union lasted only six months, being officially dissolved on 2 August 1958, after Faisal was deposed by a military coup on 14 July. Talks between King Hussein and King Faisal on the Arab Federation, early 1958. King Hussein with his cousin King Faisal. During the post-colonial years in the Arab world many forces argued for the creation of a single Arab state. Popular under the name of Arab nationalism, it became increasingly popular among young intellectuals throughout the Middle East and in Iraq during the 1950s. Many different versions of Arab nationalism arose, which developed into an Arab Cold War. The movements were led by many different leaders, the most famous being that espoused by Gamal Abdel Nasser, the president of Egypt. His vision of a pan-Arab state was one that was free of foreign and specifically European interference, with land reform, socialist sympathies and dissolution of the ruling monarchies. For royalist and pro-European Iraq and Jordan, Nasser's vision was incompatible with their existence. Led by Prime Minister Nuri al-Said under King Faisal II, Iraq and Jordan were Hashemite monarchies since their establishment in 1922 at the bequest of the British. The basis of rule in Iraq was diametrically opposite to the type of legitimate rule espoused by Nasser, who had overthrown Egypt's own monarchy in 1952, when the Free Officers Movement forced King Farouk into exile. 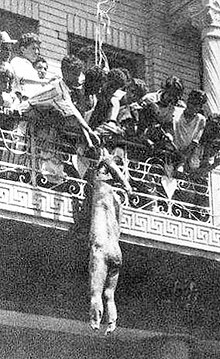 Mutilated corpse of King Faisal's cousin 'Abd al-Ilah hanging from a balcony. Crowd of men and soldiers in downtown Amman, Jordan, watching a news report about the deposition of the Hashemite monarchy in Iraq, marking the end of the Arab Federation, 14 July 1958. ^ Maddy-Weitzman, Bruce. "Jordan and Iraq: Efforts at Intra-Hashimite Unity." Middle Eastern Studies 26 (1990): 65-75. JSTOR. University of Michigan, Ann Arbor. 9 March. 2009 . Page 65. ^ Maddy-Weitzman, Bruce. "Jordan and Iraq: Efforts at Intra-Hashimite Unity." Middle Eastern Studies 26 (1990). : 65-75. JSTOR. University of Michigan, Ann Arbor. 9 March. 2009 . Page 65. ^ a b Tripp, Charles. A History of Iraq. Cambridge University Press. Cambridge, 2007. p. 135-145. ^ Brand, Laurie A. 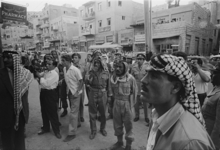 "Economics and Shifting Alliances: Jordan's Relations with Syria and Iraq, 1975-81." International Journal of Middle East Studies 26 (1994): 393-413. JSTOR. University of Michigan, Ann Arbor. 9 March. 2009 . Page 81. ^ Ryan, Curtis. "Between Iraq and a Hard Place: Jordanian-Iraqi Relations." Middle East Report (2000): 40-42. JSTOR. University of Michigan, Ann Arbor. 9 March. 2009 .